For alum Josh Weed (cohort '01) and his wife Kristin, giving back to Pardee RAND is a family affair. In 2000, when Josh approached his faculty advisor at the Air Force Academy, he received some clear advice: "Go to RAND — it will set you up for life." The advisor was right, though he couldn't have known how directly he hit the mark. Many graduates of the Pardee RAND Graduate School make long-lasting relationships during their time in Santa Monica that guide their lives and careers. Josh found that and so much more — including his wonderful wife. 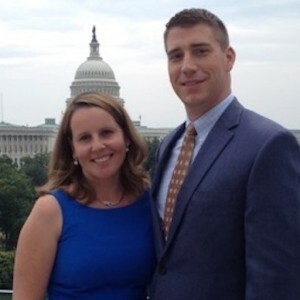 Josh Weed and Kristin Carlucci met at Pardee RAND in 2002 while he was a graduate student and she worked in RAND's Center for Middle East Public Policy. One day, as she was planning her transition to a new apartment, he offered to help her move for the low price of a six-pack. The rest is history. While earning his PhD in public policy, RAND started to play a larger role in Josh's life, but that was always the case for Kristin. Her father, former Defense Secretary Frank Carlucci, spent over thirty years on the Board of Trustees, where he and his wife Marcia engaged as donors and advisors to RAND and Pardee RAND. Frank was awarded an honorary degree from Pardee RAND in 2008. Kristin began her own RAND career as a researcher in international security and defense in Santa Monica, and later at RAND Europe. The couple has since settled back in the United States, and now reside in Texas. And though their careers have taken them elsewhere, RAND, and particularly Pardee RAND, have stayed close to their hearts. They made some of their best friends during their days in Santa Monica, and have found multiple ways to stay engaged — even from Houston. Like the Carluccis, the Weeds have a strong sense of giving back to the school, and are regular donors. They also attend commencement whenever possible, and Josh conducts alumni interviews with applicants to the PhD program. Kristin explains that it feels natural for them to stay involved. "RAND is a constant in our lives and my parents' lives. It's always been something that Josh and I have in common, that I have in common with my parents — all in different ways. These are very different relationships with the same organization. That's what makes it so special." The Weeds have high hopes for the school's future. Josh credits Dean Susan Marquis for much of the excitement in the alumni community. "I think Susan and the team at Pardee RAND have done a lot in the last few years. The effort is noticed and it makes a big difference." Josh jokes that his lifelong commitment to RAND sort of fell in his lap. "In the military, everything's issued to you, so I went to RAND, and here's your Ph.D. and here's your wife!" But it's not quite true. Both Kristin and Josh worked hard in their time at RAND, and his and Kristin's active engagement with the school fostered this positive bond.